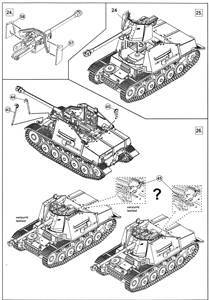 This will be the second MK72 kit I build (previously, I built the Zugkraftwagen 1t (Sd.Kfz.10) Demag Typ "D7"), so I know what to expect: a fine kit. The backside of the box clearly shows the contents of the kit, so that "caveat emptor" hardly applies in this case. Notable features are the styrene "single length" tracks (like in the Demag), the double Pak shield and the gun barrel that is split length-wise. 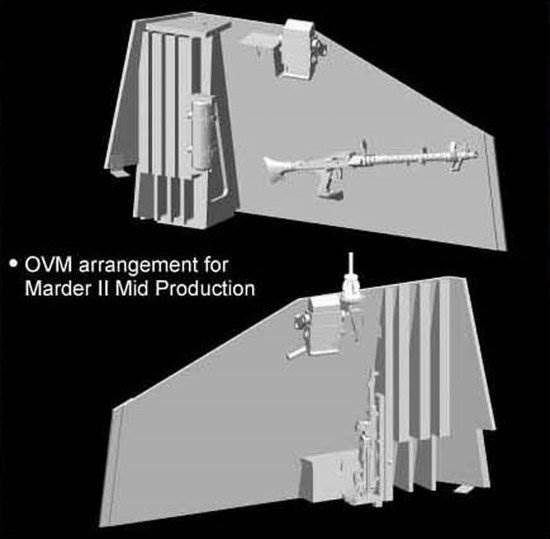 Marking options are provided for 4 vehicles, and MK72 offers a novel approach in that they don't use side-views, but three quarter views. One example even has a total of six views (and a painting on the boxtop). - 3./Pz.Jg.Abt.561, Russia, Spring 1943 in dark yellow and brown. This is Uffz. 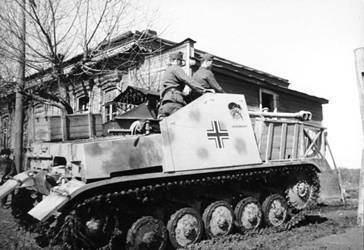 Kohlke's well-known "Kohlenklau" and one of the very few examples of German armor with a cartoon on it. - 9 Pz.Div., Eastern Front, 1943. Dark yellow with whitewash. 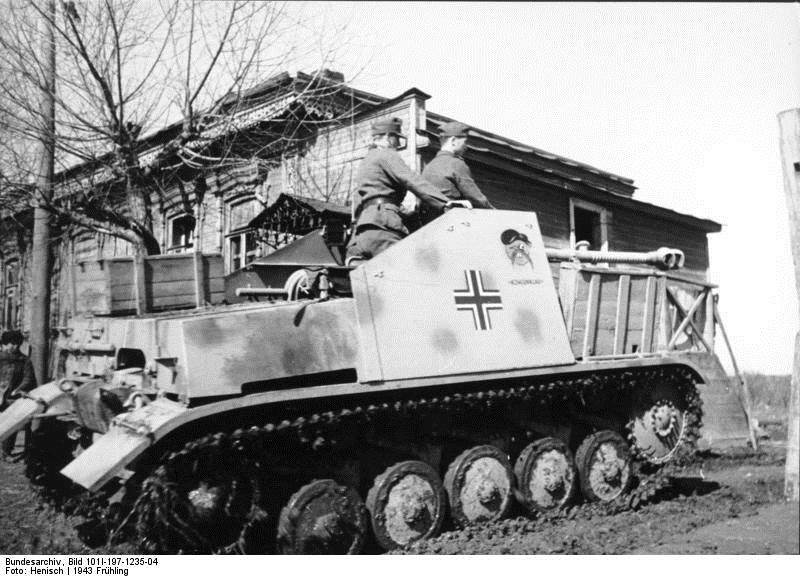 - 24 Pz.Div., Eastern Front, 1944. Three color scheme. - 15 Pz.Div., Tunisia, 1943. Overall sand brown. It's a pity that the color references are not on the sheet with the markings but on the back of the box, as the difference in printing makes it somewhat unclear what the colors are (at least to the non-initiated). In particular, the dark yellow and sand brown are difficult to tell apart. The decals look very good on the sheet. 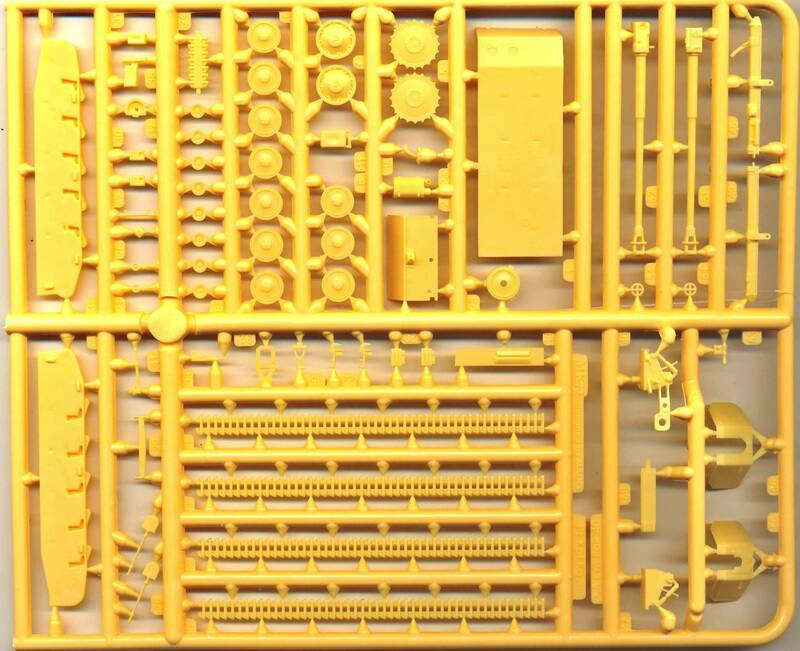 Looking at the sprues, it is clear that it is likely that other declinations of this kit will be forthcoming. 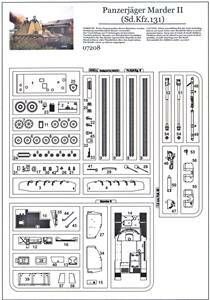 Indeed, the parts that are common to the Panzer II and Marder II are on one sprue and the parts that are typical for the Marder II on another. The Pak40 is on one end of the common sprue, but you can see that these are actually two sprues joined together, and labeled separately. The tracks only consist of four pieces, two per side. Given the experience I have with the Demag, this will bring great joy when doing the running gear. Very little to no flash can be found, and the parts are very crisp. In more than one way they remind me of what Revell offers us these days. The manual is of the "common type", and presents no difficulties at first sight. 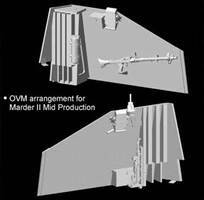 The modeler will have the option to build the kit with the gun in traveling position or in firing mode. Although I had promised myself to finish the kits that already were on my workbench, I couldn't resist removing some parts to see how they fit. Then one thing led to another. The first thing I noticed when assembling this kit is that it reacts very well to my favorite glue, MEK, which means I had to use it sparingly. This observation is probably linked to the styrene being somewhat softer than on other injection plastic kits. I rarely follow the sequence of the kit instructions, as I try to get as much work done in parallel as possible. In this case this led me to go for three major subassemblies: lower hull, upper hull and gun. The lower hull has a fair amount of detail, which will be sufficient once the gun is in place. 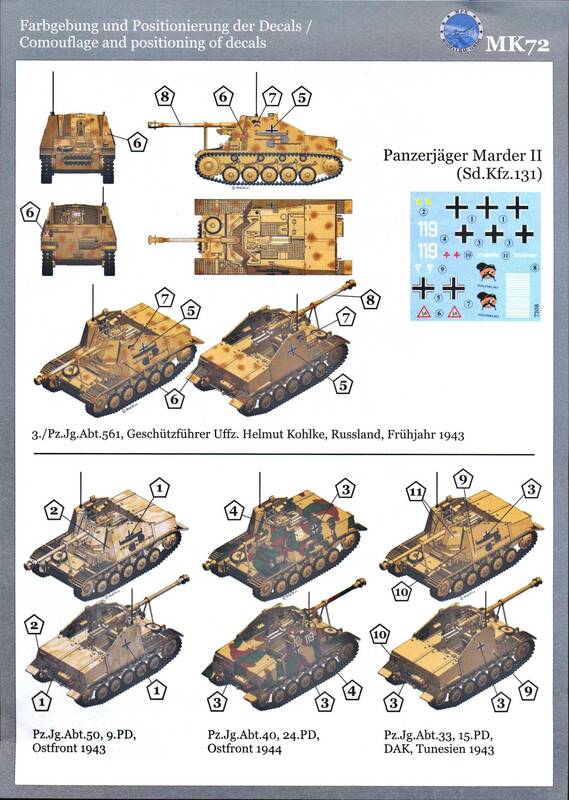 Still, a quick glance at Achtung Panzer  taught me that I will probably hang some more stuff to the inside of the walls. Quite a number of parts have no locating pegs, which makes correct instalment a bit trickier. This is especially true for the position of the interior with respect to the rest of the lower hull, which got me thinking. 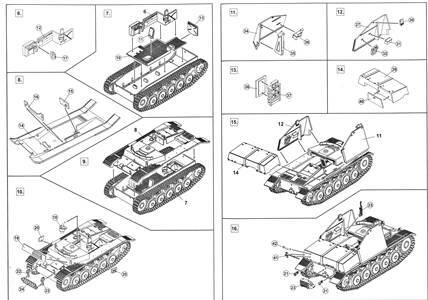 I first built the armored lower hull (the box like structure - step 1 in the instructions) and the interior assembly (step 6 and part of step 7). As the lower hull will have to fit as snugly as possible to the upper hull later on, I used the latter as a guide in the following way: I glued the interior to the lower hull and while the glue was still wet, I dry-fitted the upper hull in place so the promontory of the lower hull (red arrow) slid into the corresponding notch of the upper hull (red arrow). By this time I had fitted as many parts to the said upper hull as possible. It might be due to the absence of locating pegs, but the transmission (which is nice, by the way), doesn't connect to the drive shaft. A small slice of stretched sprue will remedy this. A word of caution: make sure not to cut off the locating peg of the backrest of the driver's seat, as I did when cleaning up that part. 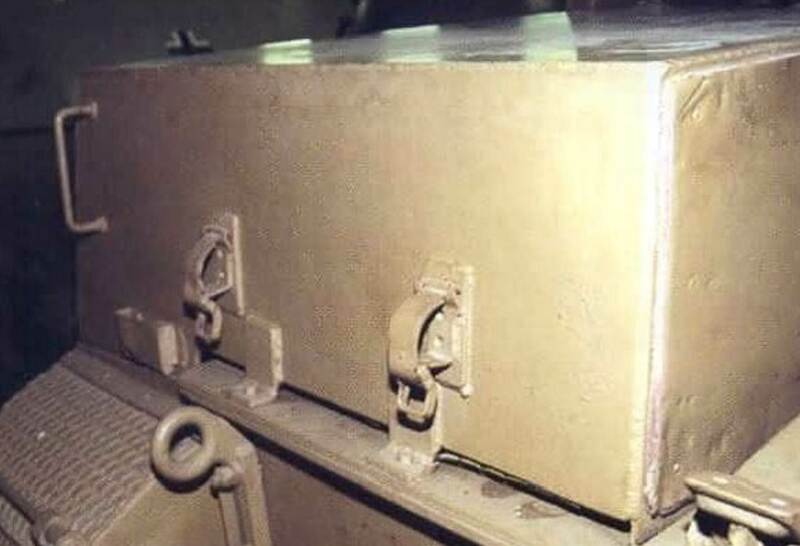 As you can see, there is a sink mark on one of the boxes, and an ejector mark on the inside of the lateral armor. The ejector mark will be a little bit tricky to remove, but it's shallow, so a thick coat of acrylic paint inside the depression and some wet sanding will (hopefully) do the trick. Other ejector marks were found between the suspension. 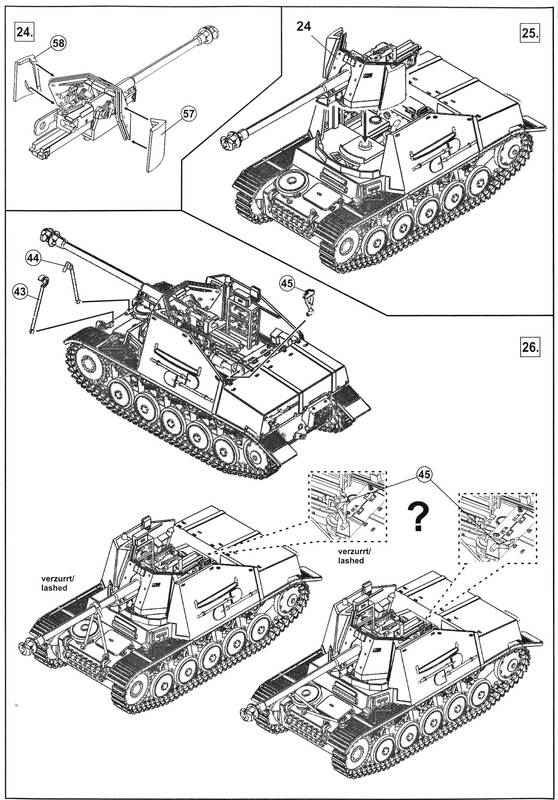 While the ejector marks on the upper armor need to be there for technical reasons, either on the outside or in the inside, and will require attention whatever the choice, MK72 could have done better by arranging the parts so that the ejector mark was on the inside of the hull, instead of on the outside where the presence of the suspension makes sanding very difficult. If you wonder what the rounded rectangular frame is to the left, it's (supposed to be) a hose. I don't think it's particularly convincing. There is a small locating peg for this part on the armor, but I shaved it off, as there is no receiving slot on the backside of the part. 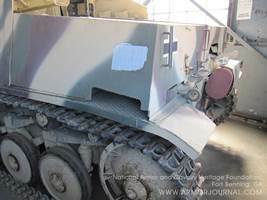 The small box-like structure at the top of the armor plate is a periscope. It had two positions: raised for combat, or lowered. MK72's instructions have you install them in combat position, which is fine, but I went for the lowered position. I also noted that the upper hull armor is very slightly concave. Another area that will require a little bit of work is this area of the fenders, where molding limitations resulted in a see through effect. A triangle of styrene sheet is already on its way to cover this. 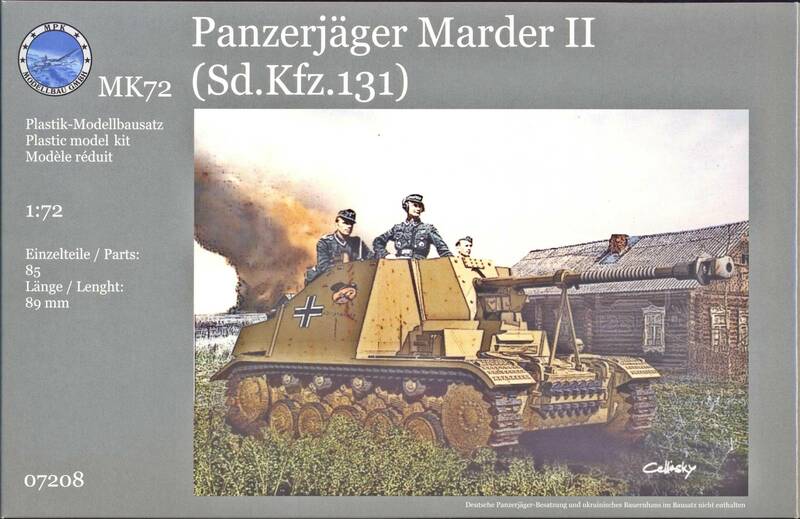 Upon comparison of the MK72 kit with photos of the real thing and with 1/35 kits, I can now conclude that the kit is based on the Tamiya 1/35 kit. The interior details do not match any real vehicle, but they match very well with the Tamiya kit, with all of its bad 1970's research. Big oops. 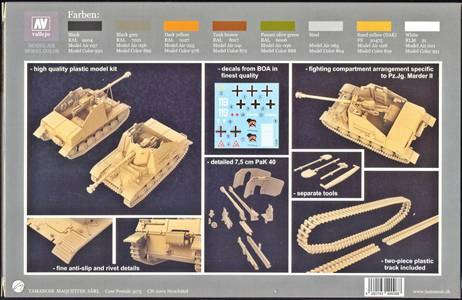 If we use the Dragon 1/35 kit chronology. Dragon kit can be roughly divided into early, mid, mid late. The details of the MK 72 kit mostly correspond with Dragon 6262 or, in term of an actual vehicle, the samples preserved in Pansarmuseum in Axvall, Sweden, or (more likely) in Fort Benning, United States, The builder who doesn't have who wants to do a minimum amount of scratch building should closely follow Dragon 6262 instructions in deciding where to put things, particularly when it comes to the interior. The locating marks are practically useless. I will come back to the upper hull later, as I first need to finish the tracks and running gear before I can glue the lower to the upper hull. With the type of track that MK72 uses, it is well-nigh impossible to add the tracks after gluing both halves together, unless you cut them up which would undo the very reason of them being in long stretches. The use of two long stretches of styrene track is an innovative feature, pioneered on the Demag. They are very thin at the points where the individual track links join together, making them very easy to bend around the sprocket and idler. Being styrene, they can easily be glued to the drive sprocket, idler, etc. 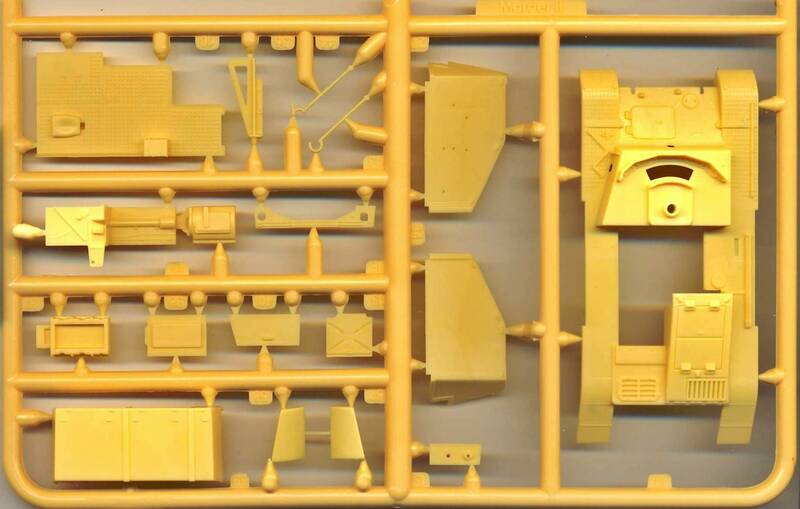 Of all the types of tracks that I've used over the last couple of decades (rubber band, link-and-length, Dragon Styrene) this is by far the system I prefer. 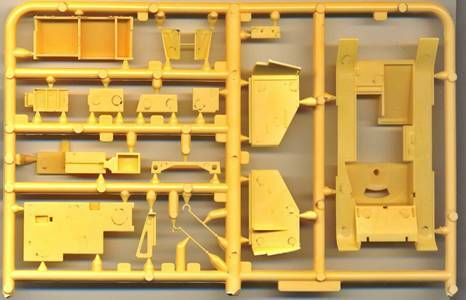 I don't see any reason why it can't be done by other manufacturers of styrene kits. I would have preferred to have a single length, instead of two per side, but I guess this was not possible given the dimensional restrictions of the sprues. Apart from the speed of assembly, the main advantage is that you are almost sure to have perfectly aligned tracks, unless - like I - you manage to break one when bending it. They are very fragile, so take care. Another advantage is that sag can be easily reproduced. Realizing that a part of the lower hull would be very difficult to paint after installing the tracks, I decided to paint them beforehand. This meant I had to choose the paint scheme at this point. Not surprisingly, I went for "Kohlenklau", pictures of which were found on the MK72 website (copied above). I chose to install the drive sprocket, road wheels and idler first, then add the tracks, and then the top rollers. 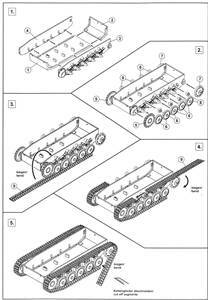 This might seem weird, but building a UM Pz38t shortly before this kit, got me scared as the different wheels, sprockets etc didn't line up very well, making it impossible to get the tracks running in a straight line. On top of that, spacing between the fenders and the tracks was very limited. 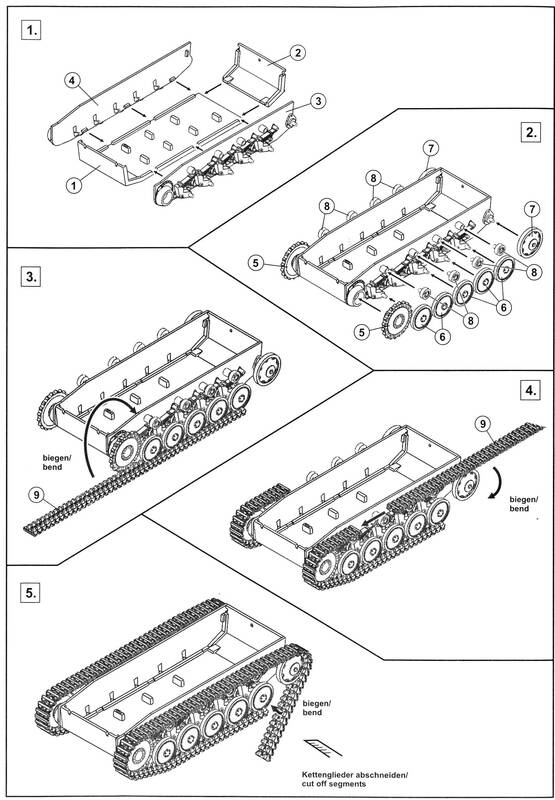 I guessed that doing the tracks first, which were sure to be in a straight line, and which could be lowered a bit afterwards, would avoid this problem if it presented itself in this kit. Well, let me tell you that it is not a good idea because a) the problem doesn't present itself and b) it is very difficult to align the return rollers afterwards. There is plenty of track to go around. By plenty, I mean that you have to cut of a couple of centimeters, which you could turn into spare tracks. Might this be an indication that a longer hull variant (like a Wespe) is under way ? 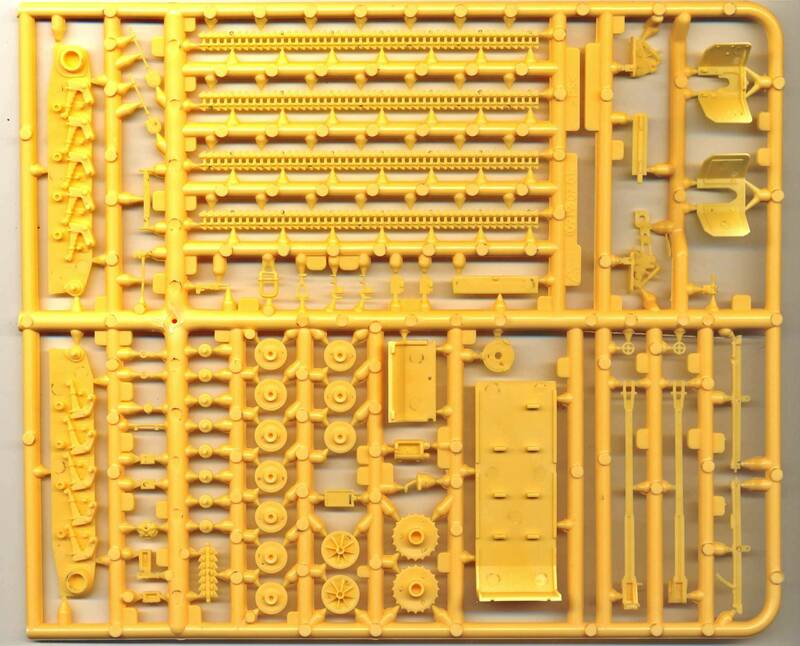 The tracks have nice detail on the inside and on the outside, but due to technological limitations the track pads are solid and not the skeleton type of the real thing. I guess the only option currently available to do this would be photo-etched tracks, if only for the needed structural strength. I also had the impression on the sprues that the wheel rims are not 100% centered, but after assembling and painting them, it seems ok.
You might also be interested to know that the instructions have you install the tracks on backwards. How many times I have already had to write this in reviews (of any manufacturer) is quite surprising. Meanwhile I also realized that the nice bit of machinery inside the hull is not the engine, but the transmission. It makes more sense now. The radio set was moved a bit to the rear and inwards, as it seemed to interfere with the lateral armor. After assembly, I did some elementary pre-shading to make sure all areas that will be difficult to reach are painted. I then started adding some of the smaller bits. The exhaust has a hollowed out end, which is nice. - The springs on the rear mud flaps. (I don't think I'll bother with those). - A small pin for the towing pintle (easy enough). - The handle that MK72 provides for the rear of the hull is not readily descernible in the pictures, but I think I might add it regardless. A pity there are no locating holes for it. - The pictures show a (tow?) rope instead of the spare wheel on the glacis. I see no reason why "Kohlenklau" might not have carried a spare wheel at one time, so I'll go with that. - The picture also shows that "Kohlenklau" had fewer spare tracks than the kit, but that might just be a moment in time. - It seems I will need to scratchbuild two boxes, one for the front right fender, and one for the rear of the vehicle. 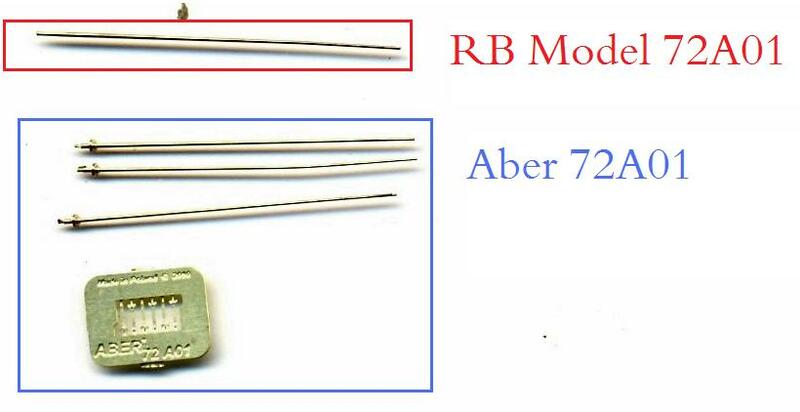 - The position of the antenna seems to be that of the earlier models. I will shave off the (not too convincing) stub on top of the right lateral armor plate and add an antenna base from BP Resin to the left side. - early features like the early type track rack, lack of bolts on the rear flange of the lateral armor plates presence of the hand crank on the fenders and presence of vision ports where the radio operator used to be in the Panzer II. (I guess this will be present on rebuilt vehicles as well.) It is difficult to tell if "Kohlenklau" had this feature due to the box being in the way. Other possible additions are the splinter guards at the front of the lateral armor, but again little will be seen. Also note that the position and type of the boxes inside the fighting compartment varied. What I will add however are a fire extinguisher from CMK (the position of which varied) and the MG34 (or at least the clamps for it). 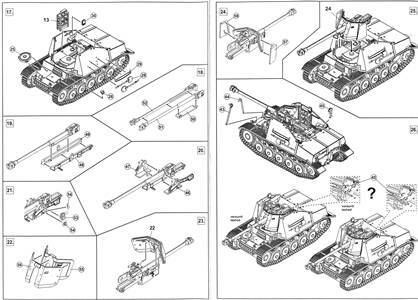 If you want to build the Swedish vehicle, this is how it should be added. Here is how things look on the American tank. If you want to build Kohlenklau, you actually need two handles, placed horizontally. Now, the builder trying to build Kohlenklau should follow instructions for Dragon 6423. Regarding the position of the antenna: the radio isn't on the right on the earlier version. At this point, all that was left to install was the gun assembly. The way MK72 has engineered the gun, with the barrel split lengthwise, will allow for a well detailed muzzle brake without slide mold technology, but I tend to have a penchant for metal barrels, so I swapped it for the RB Model PaK40 barrel (72B05). This presumably comes with the flattened muzzle brake seen on the picture of Kohlenklau, but it looked quite round to me, so I flattened the flanges a bit more with a file (see discussion here). Note that the muzzle brake in the kit doesn't capture the look at all. Muzzle brake in the kit. The kit correctly gives an outer and an inner shield, but the inner shield was marred with ejector marks on the visible side. Not difficult to correct, but engineering the sprues with the ejector marks on the other side would have saved me some pain. The installation of the gun assembly gave me the most trouble in the construction of this kit. 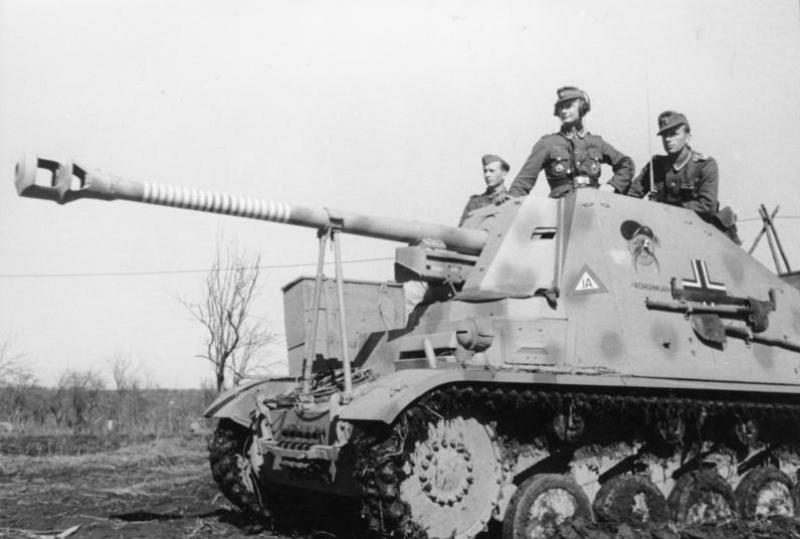 First of all, you have to realize that the Marder II's interior is cramped, and the inward sloping armor of the fighting compartment doesn't help matters when you have to insert the gun afterwards, but that's not the whole story. When finishing the gun subassembly I noticed that I had to widen the opening in the inner shield. This might be due to the metal gun barrel that I used, but when I dryfitted the whole subassembly to the hull, I noticed that the gun pointed downward, even at maximum elevation. This was remedied by more sanding of the opening in the inner shield, but even with my best effort I could only get the gun (barely) level. At this stage, the opening is notably larger than the real thing. Dryfitting and checking with pictures showed that the whole gun sits a bit high on the vehicle. I wondered whether I had made a mistake during assembly, or whether the metal gun barrel is to blame, but I wasn't able to get to the root of this issue. So I took the whole assembly apart again and sanded down the pivot for the gun. I then installed the gun shield at the height I wanted it to be. In this way I was sure there was no gap between the splash guard and the gun shield. I then installed the gun cradle, and finally slid in the gun. Even then you will notice that the "ears" that are added to the gun shield do not correspond with the real thing (and I am sure I installed those as the instructions indicate). On the real vehicle they come very close to the opening for the optics, and are thus more vertical than in the kit. In retrospect, I could have worked around that issue by installing the ears in a more vertical fashion, and sanding the top and bottom down to align them with the hull armour again. I installed an antenna base from BP Resin and added it to the left armor plate, on top of which an antenna from RB Model was placed. Copper wire was then added to connect the radio set with the antenna base. (I am still wondering why the radio is on the right and the antenna on the left.) I still needed to add scratchbuilt headphones at this stage. Note that I have removed the MP40 from its bracket on the left of the fighting compartment, as I needed it lying around in the diorama I have in mind. I will use a Preiser part for that. The MP40 in the kit is not that very convincing in my view anyway. The same goes for the MG34 (which isn't included in the kit). 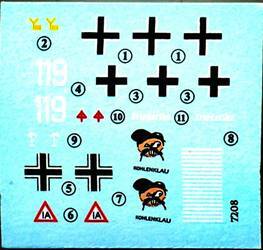 The pictures of Kohlenklau (and sister vehicles) show two additional boxes added to the vehicle. I scratchbuilt the one on the right fender and left the one at the rear off. Painting started with a flat black base on top of which Tamiya XF-60 was sprayed. Blotches were sprayed free hand with Vallejo red brown. The decals went on smoothly, but notice that the Kohlenklau cartoon is a bit too large, as is the handsaw on the left armor plate (see pictures above of the real thing). This results in some interference. The triangle marking on the rear of the engine compartment likewise was hindered by the axe. A beautiful little kit that goes together well, and needs very few additions/corrections. 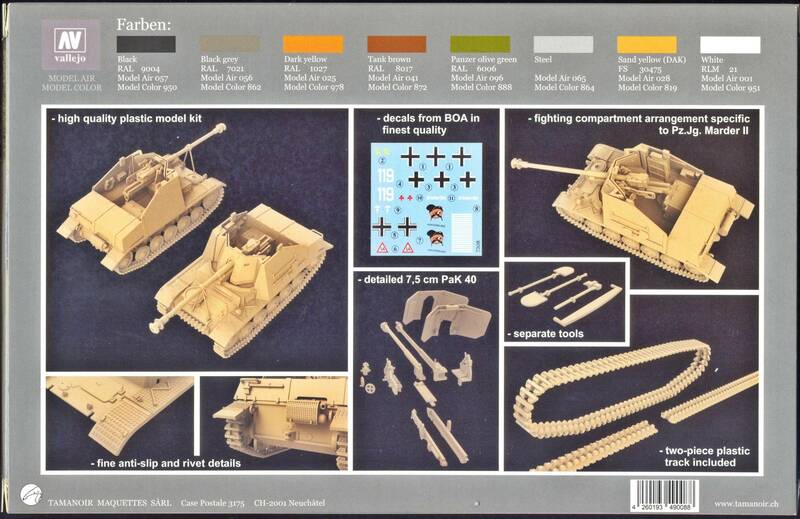 I have been told some of the sprues in this kit will be used for another kit in the near future. A bunker which I bought a very long time ago. 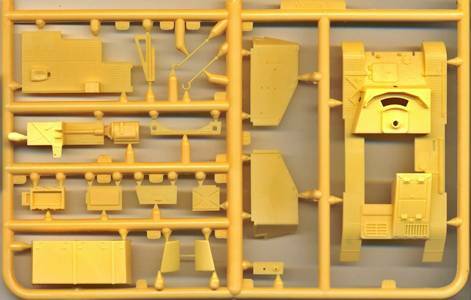 All I can remember is that it comes from a wargame-oriented manufacturer and is in resin. Figures from TQD, set GH9. 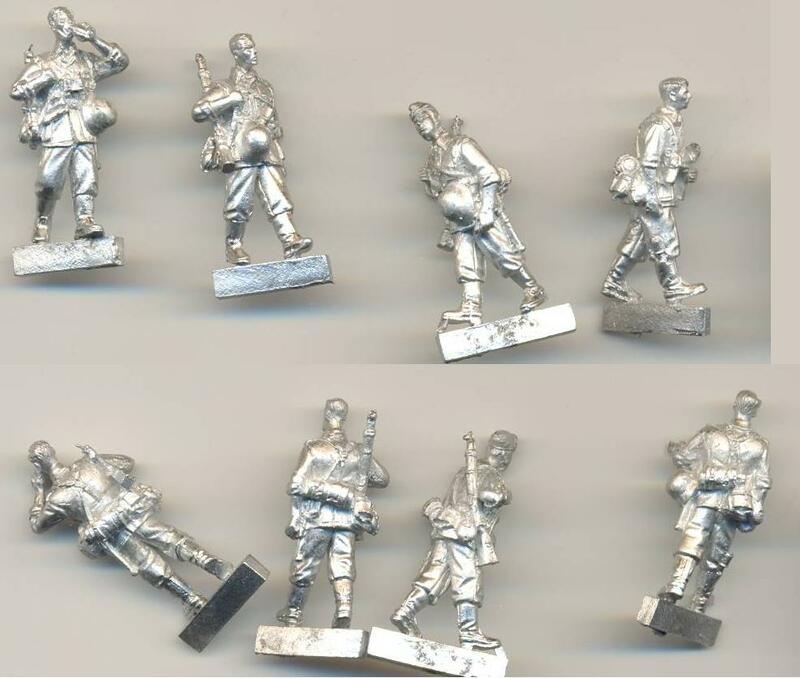 Figures from Lamercraft, set LC07. 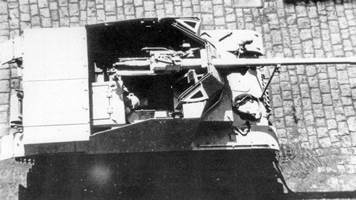 A turret from an Esci T-34/76. 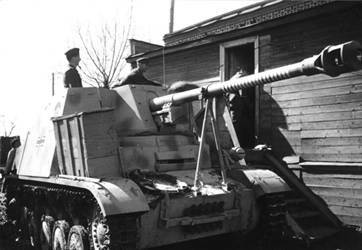 A 45mm gun from Zvezda. Various diorama attributes (posters, boxes,...) from long forgotten sources. Thanks to Matthias Conrad (Maco) for the review sample.